Working on a PROJECT ? Please pass it along. 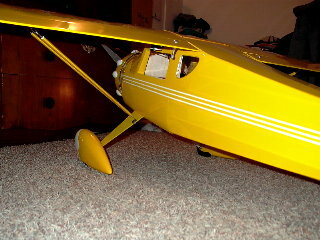 After finishing the AgWagon I am taking time off from building. 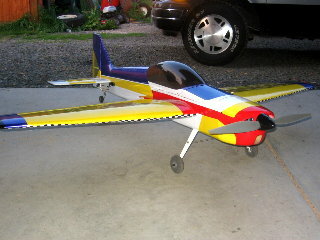 I hope to fly a lot more this summer and I put building on hold tell the rains come again. 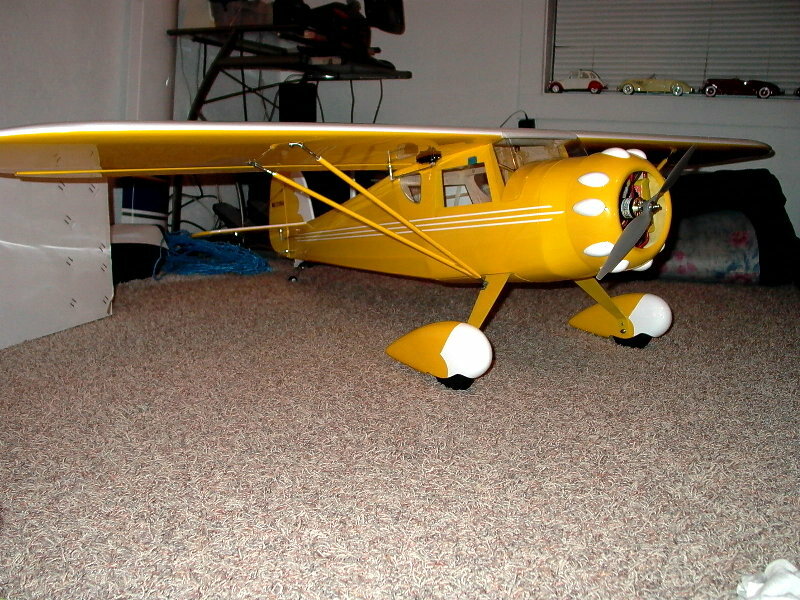 However, I have my next project. Eaa Museum in Oshkosh had a 3 view for $15.00. So I ordered it. It came on an 8 ½ by 14 in paper. 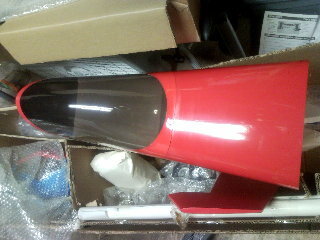 HMMmmm How am I guna blow that up to the size I wanted to build. That was 4 years ago I go the 3view. 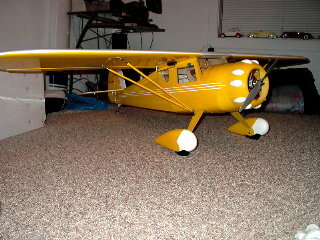 Last month I wend to see the kids and grandkid in California and I was given a float plain kit. 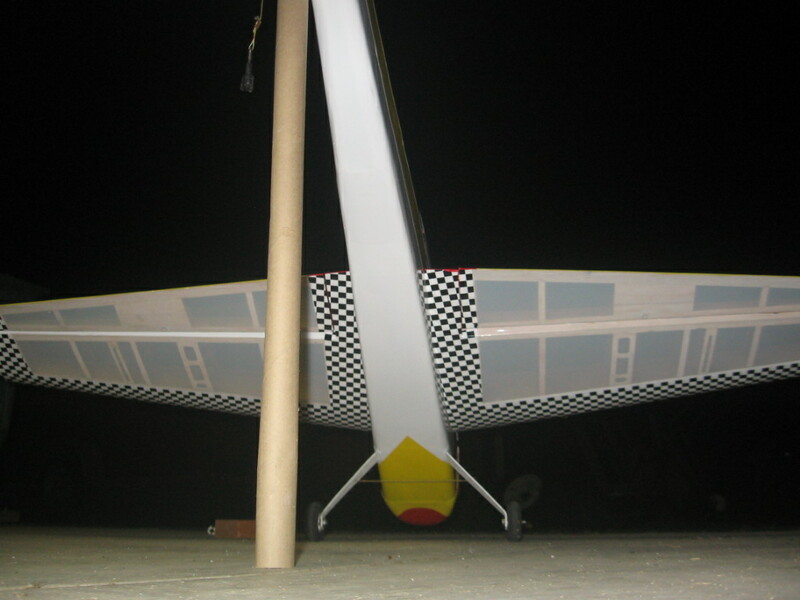 One of them flying boats (CRUSER II) with no plans. 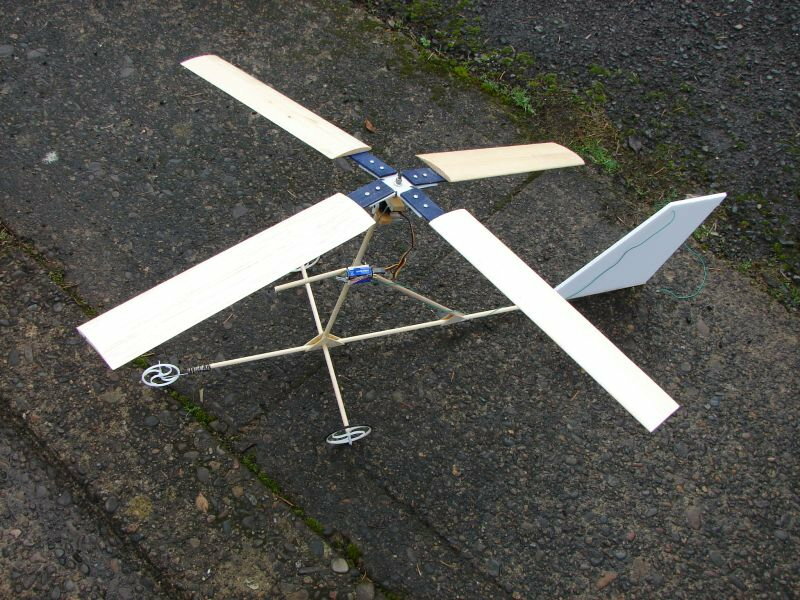 So off I went on the internet and Google search for plans for this thing. Well to make a long story short, in my search I ran across a web sit (My UNCLE WHILLY) that was said to have most plans. My search didn’t find any plans for the curser ll, but on page 13 (and I always thought that it was an unlucky number) was BONZO. Well after looking at the plans I don’t remember if I wet my pants or thought about it!!!!!!! 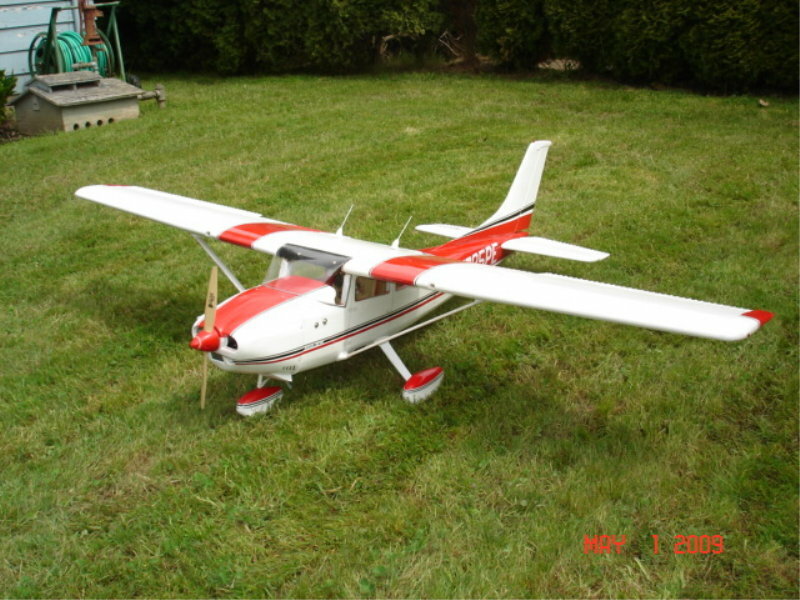 Forget about the CRUSER II !!!!!!! So for $5.00 I got plans for LITTLE BONZO!! I’m so happy!!! I was also happy about the fact that I could send this file to a guy that will make paper prints any size you want for $19.95 any size !!!!! So I emailed him and yes he can and yes he did!!! 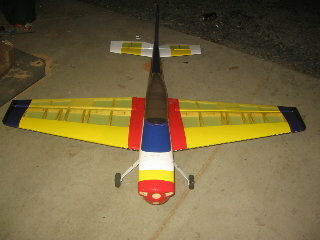 I now have planes for a BONZO with a 62in wing. 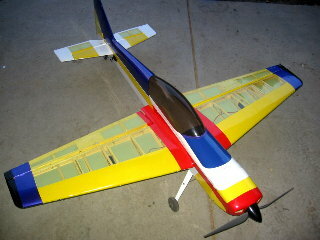 It will be powered with a Saito 91 that I have had for this plain, also for a long time!! 62 in wing makes it 33% scale. I’m in no hurry for the rains to come, but !!!!!!!!! 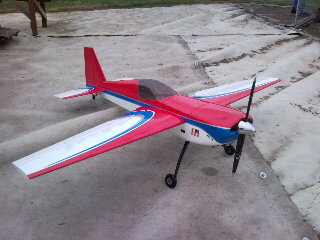 The new plane flew, and flew very nicely. It started out a little too tail-heavy for my taste, so I moved one of the batteries a little bit and was able to get the balance just about right. 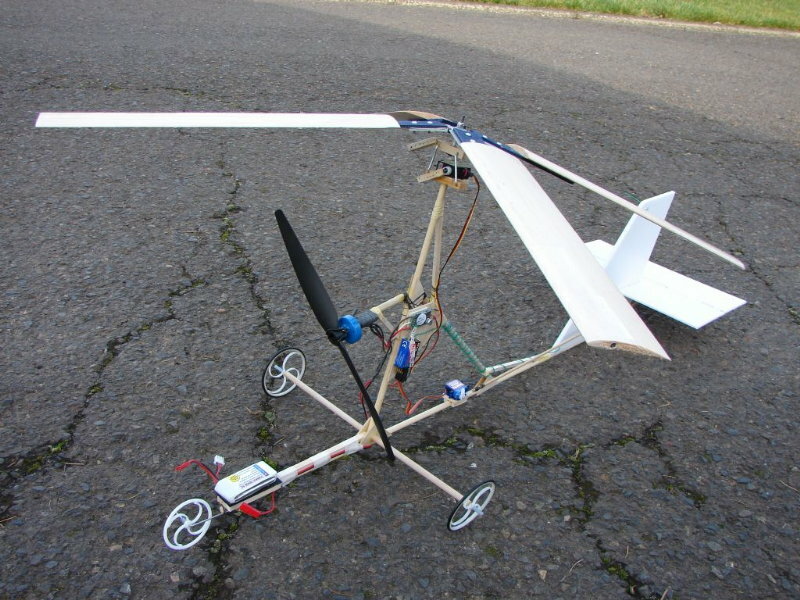 However, on the fourth flight, I got a little delay in the control response and decided to bring it in and try and find the problem. I’m going to move things around a little bit, away from the receiver, and try again next week… maybe even on Saturday since I have that day off now. 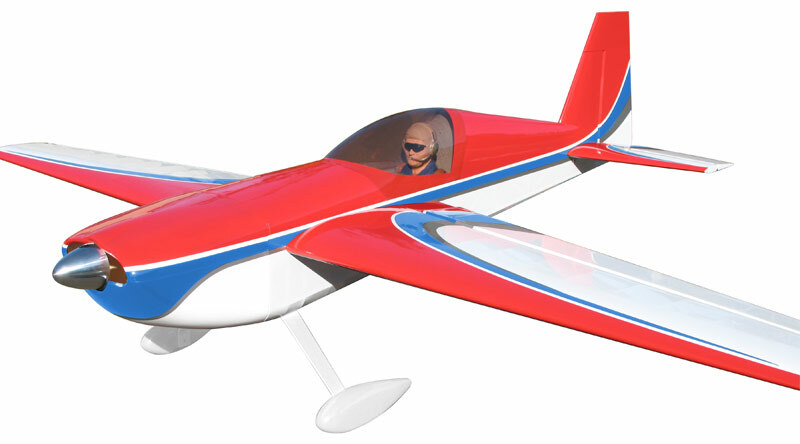 Everyone asked how the Extra 260 compared to the Yak 54. 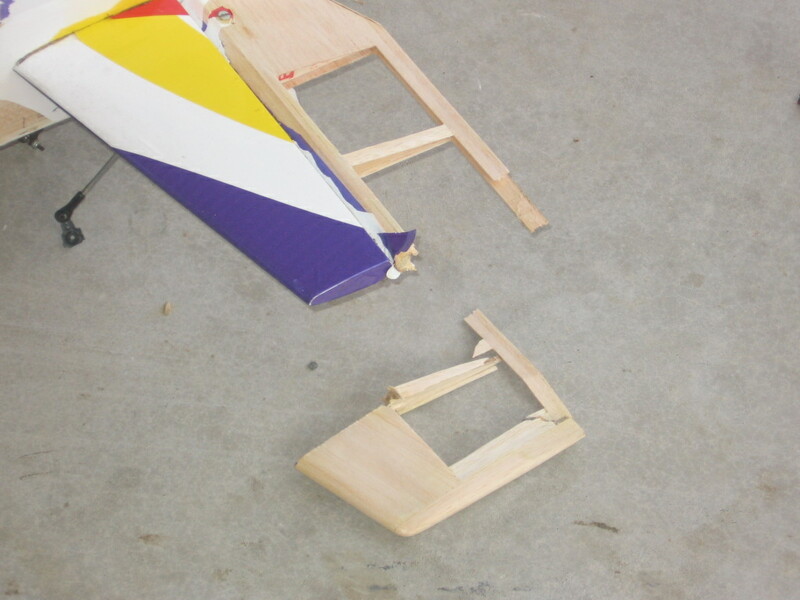 The Yak tumbled better and seemed to be a little more precise. 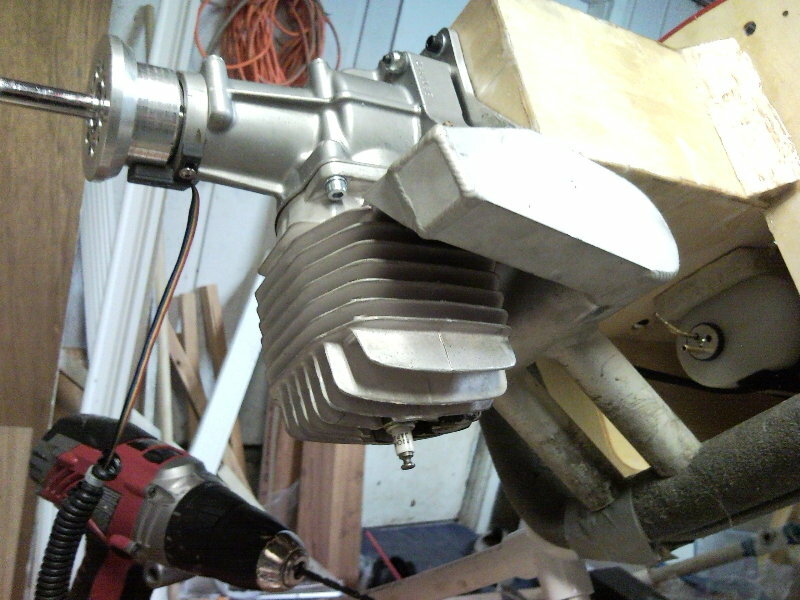 The Extra holds a hover much better and makes torque rolling easier as well. 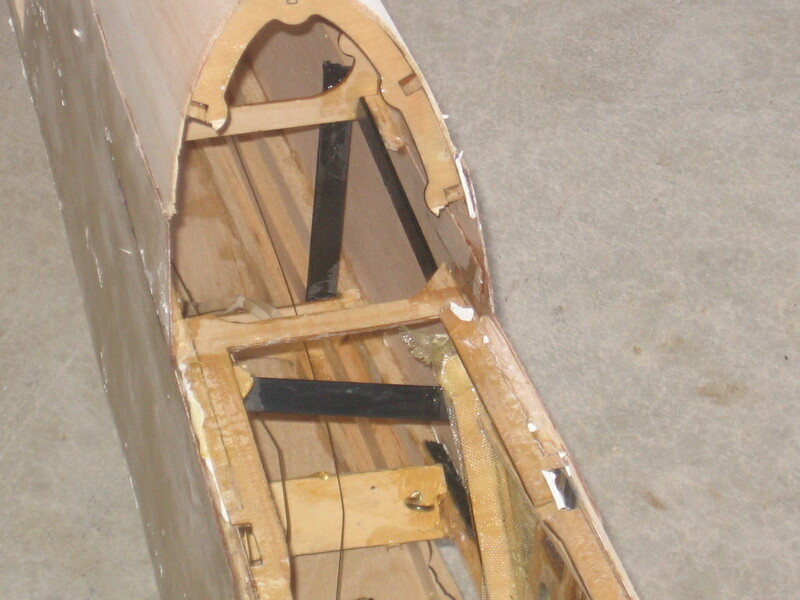 The Yak’s rudder was a little bigger and it had more rudder authority in knife edge. I had a hard time getting a solid harrier with the Extra today, but I may have just not found its sweet spot yet with the perfect combination of attitude and throttle. Again, I’ll be making some adjustments to try and get the Extra up to par on the characteristics where I feel it’s lacking. 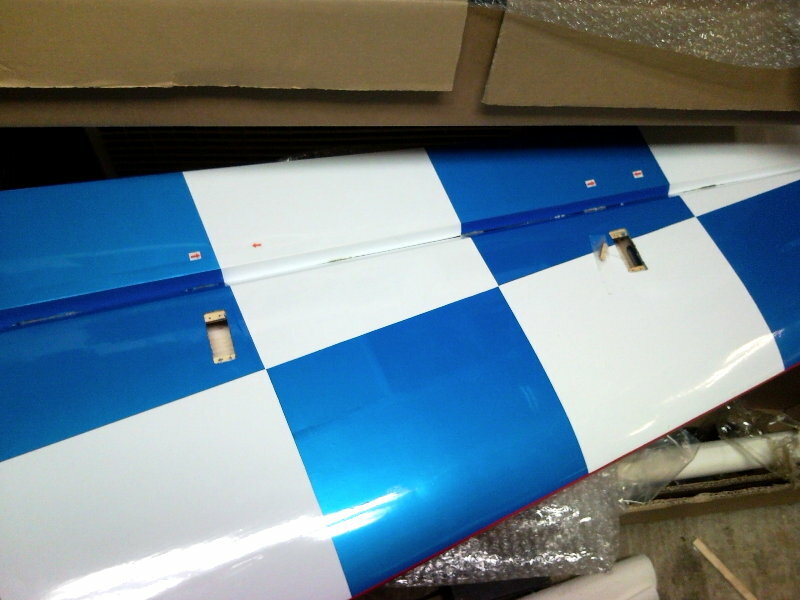 The 3W85xi is now installed and the cowl has been fitted. 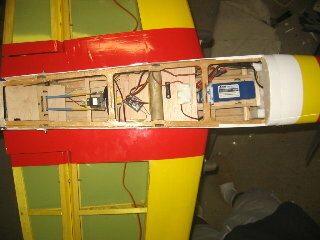 I have installed the servos for the rudder, elevators, throttle, and choke. I discovered that my smoke pump is, once again, not working, so I’ll be sending it off for repairs again. 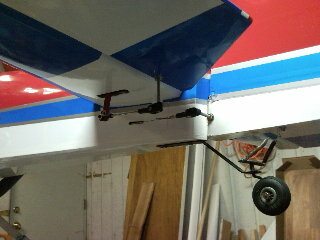 The stabs are now installed and the hinging is all done. 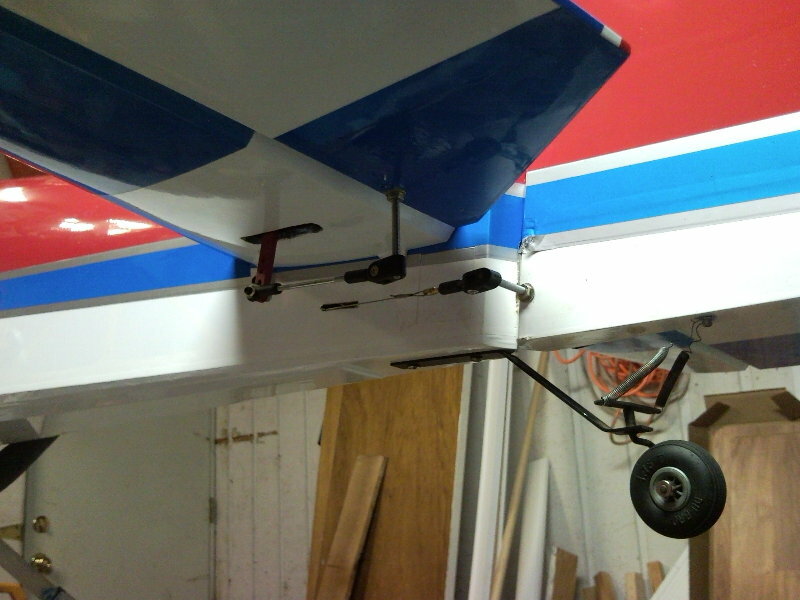 The installation of the rudder servos was a bit tricky since it is set up for just one servo, but I have a special SWB metal tray for two servos. 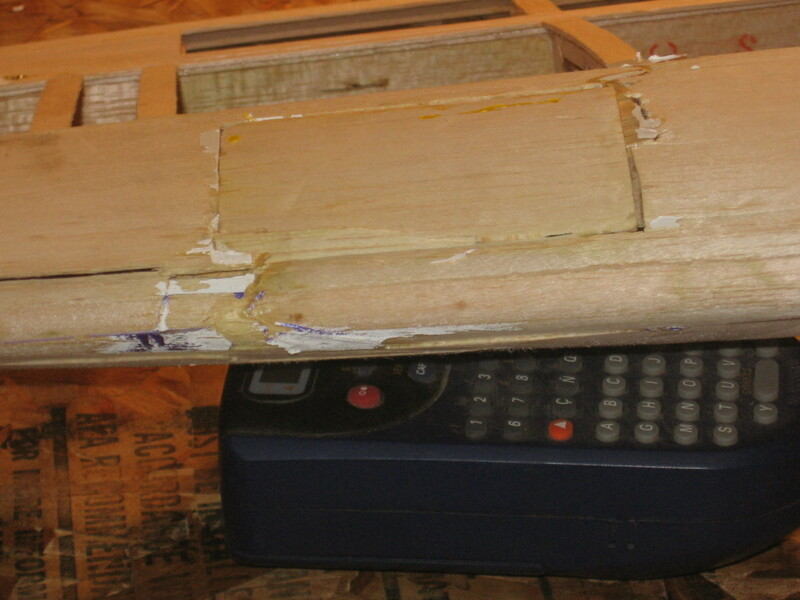 I had to do some cutting and reinforcing to make it work and make it strong. I also fiberglassed the entire engine box for extra strength and rigidity. 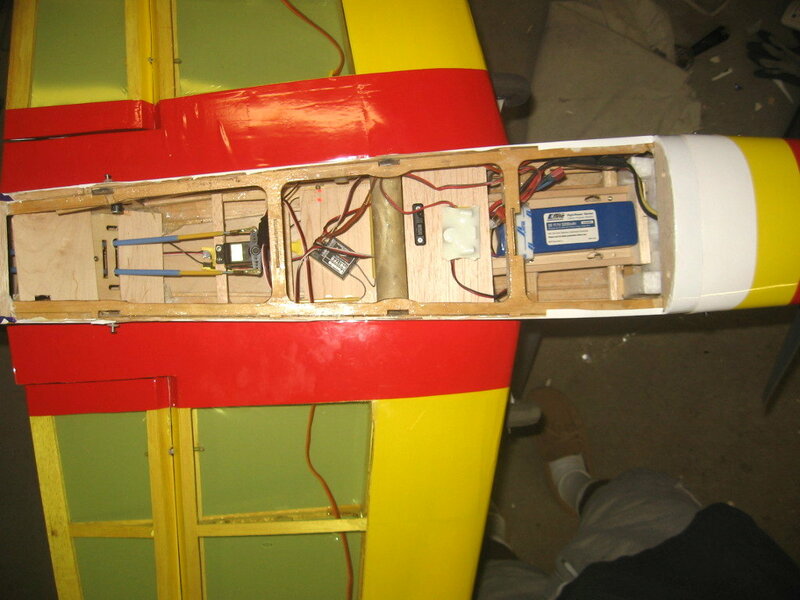 Next comes installing the servos and control horns for the ailerons. I’m going to be using slightly stronger servos than on the Yak, since I had them lying around. They are slightly slower, unfortunately, but I’ll make do. The new servos are Hitec 5645MG’s. I took them off the elevators for the Yak and the ailerons on my Giles. The Extra will have the T170 titanium gear 333oz/in servos on the elevators and two Hitec 5955TG’s on the rudder. In the pictures, you can also see the 2” SWB aluminum servo arms that have become the standard for these big planes with big servos and big control surfaces. 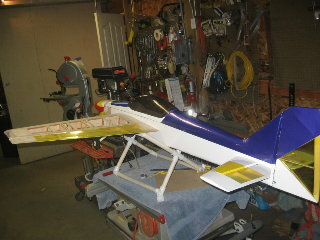 The biggest hurdle I’ve run into so far has been the installation of the engine. 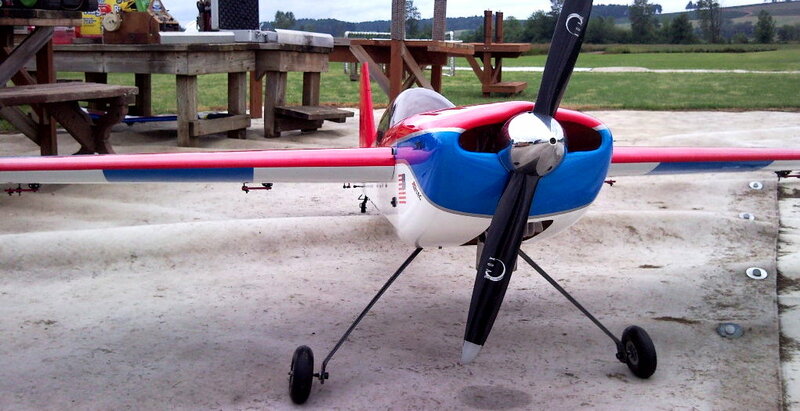 The 3W85xi is at the top of the range for this plane, although I’ve heard of people fitting 100cc twins in them. 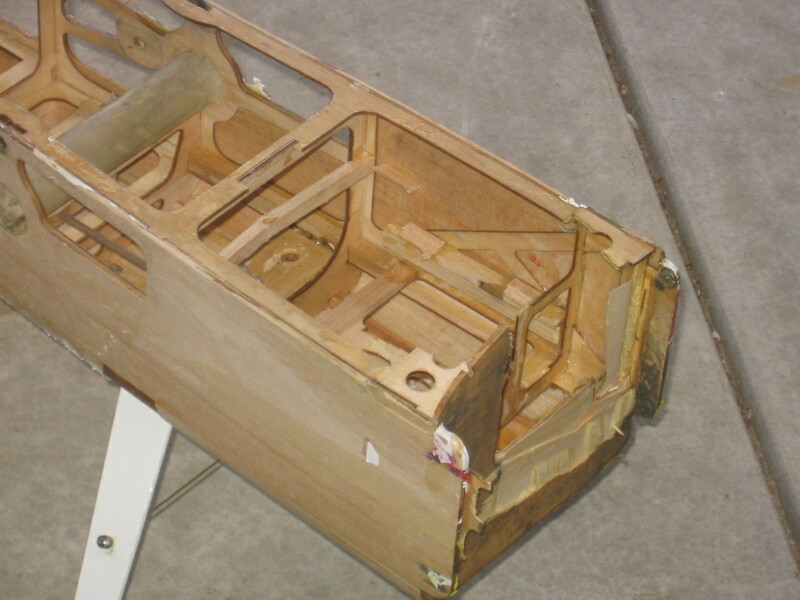 The footprint of the engine mounting plate took up almost the entire firewall. Here’s hoping and praying that it is going to be strong enough. There is not a lot left to do, but because of some work-related issues I probably won’t have the chance to test fly it for two more weeks, possibly on 6/7 or 6/8. I have purchased a replacement airframe for the Yak 54, which is in need of some respite and some cosmetic assistance, (not everyone wants their plane to look like Doug’s yellow monstrosity!). I brought it to the meeting the other day and let the membership see what a nice job the company did assembling and covering this airframe. So far, I have gone over all of the covering with an iron to make sure that all of the seams are sealed and the few wrinkles are gone. 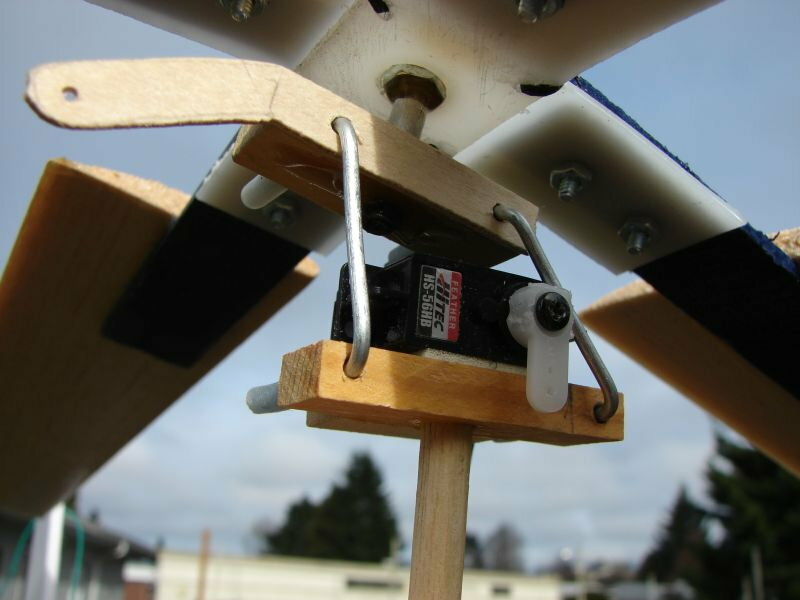 A lot of people skip this step, but the fact is that when these ARF’s are covered in the factory, they are in a hurry to get them done, and the plane travels overseas with different temperature and barometric pressure exposure during the trip. Therefore, I highly recommend taking this step. 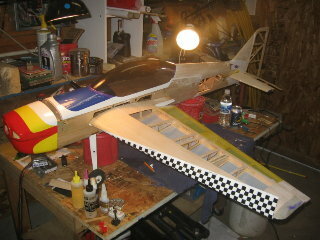 Next, I glued the canopy in place using some canopy glue from Eugene Toy and Hobby. 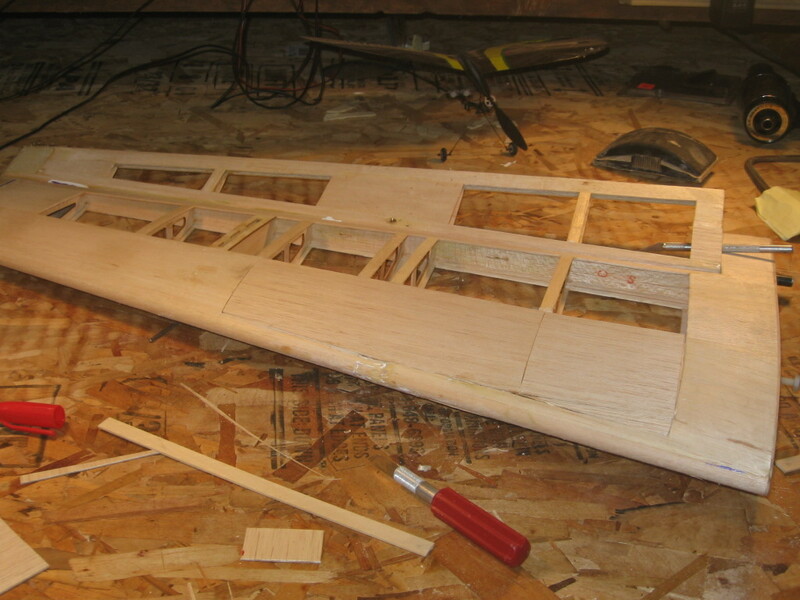 And then, the biggest step, and perhaps the most important to get just right, I’m installing the firewall. 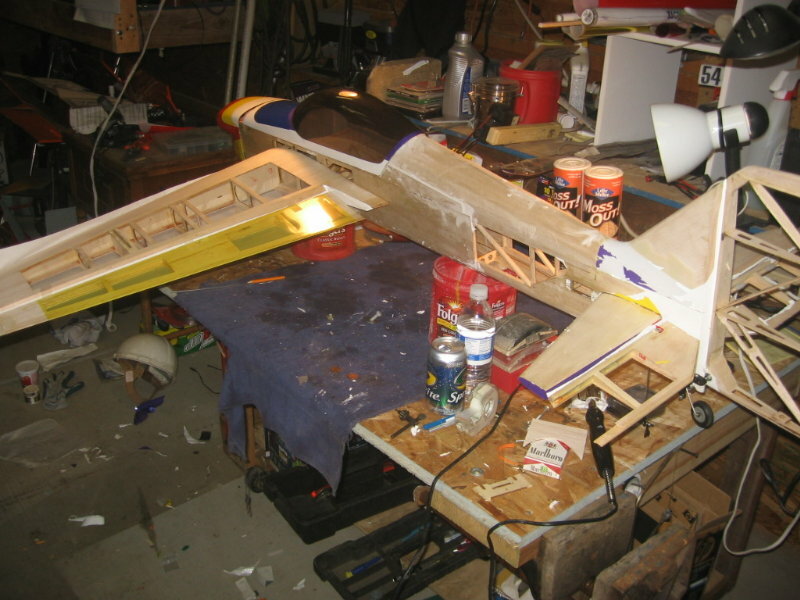 It took about ½ ounce of epoxy just to get it set in place and attach the top of the motor box, along with some balsa triangle stock in the corners that I insist on using to help make the structure stronger and more rigid. 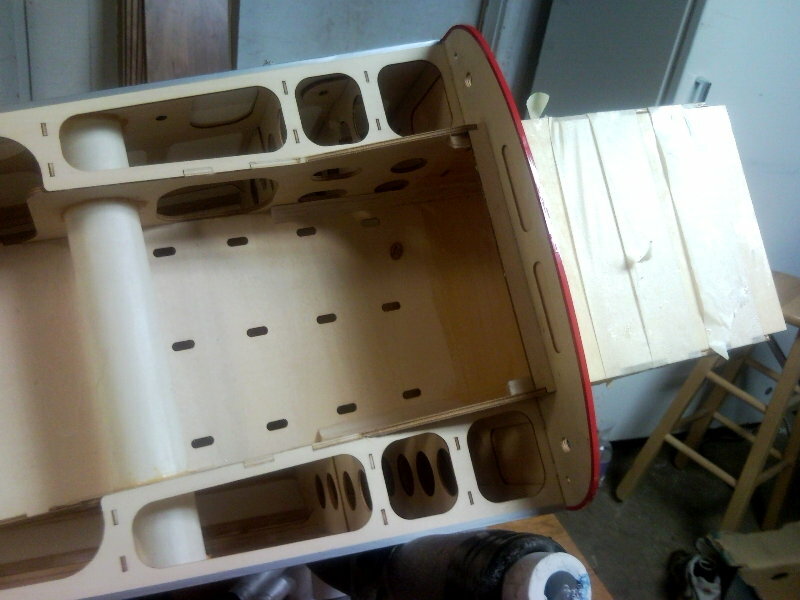 I also added another 1/8” of ply directly to the back of the firewall before installation since I am using an engine on the high end of the recommended range. Next comes the hinging, which I hope to start tomorrow night. I will be moving all servos from the Yak to this plane, along with the engine, (3W85xi) and the nifty carbon fiber landing gear. Just got done with my last kit build, Sig Senior with a 46 ax for power. Wanted to share with club. Chick foster. Khoi donatated this to me. I understand that its been around. 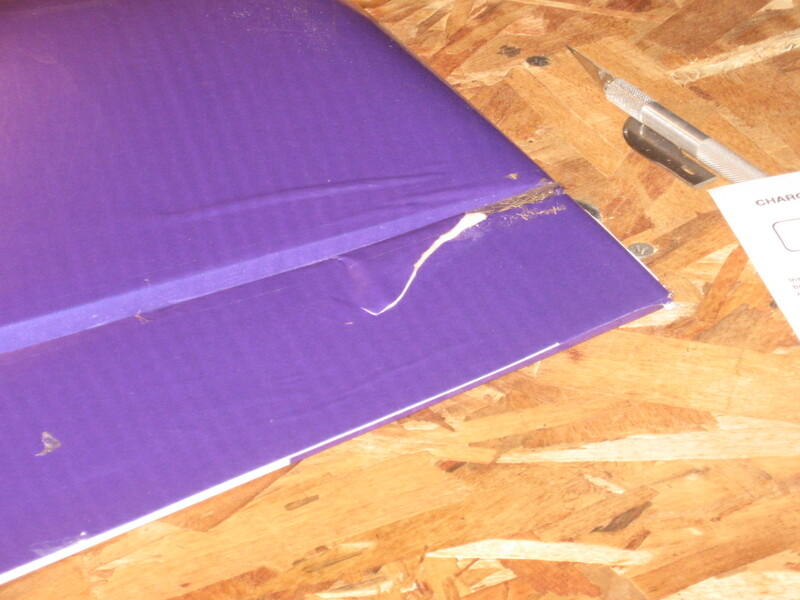 And when I got the covering off........Its been around allright. And down and up and ran into things. 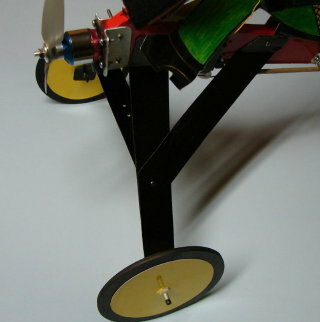 But thats OK its a good project. It will be resorected with a 160 electric motor and Castle Creations 85HV ESC. 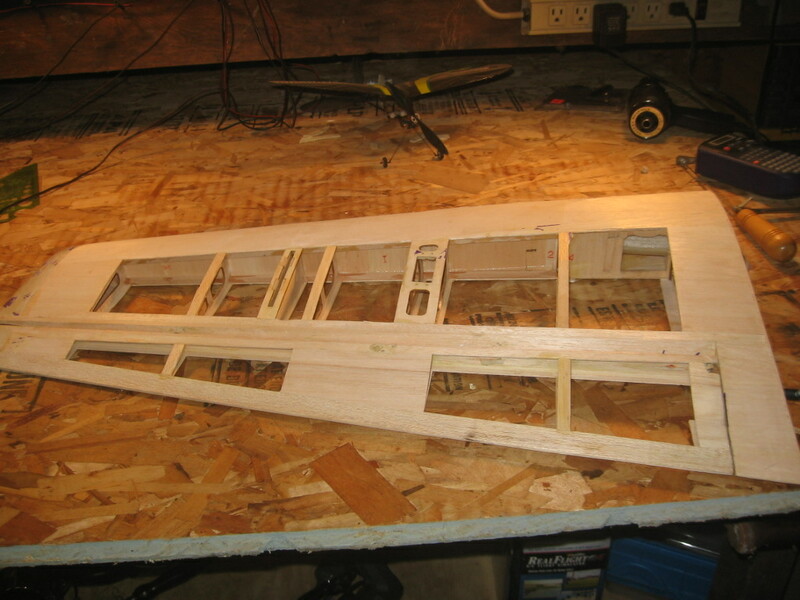 I will keep sending you pictures as the work progresses. 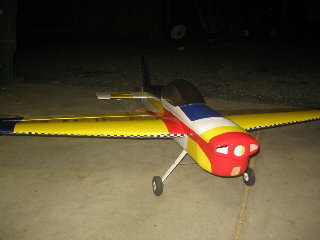 I hope to fly it at the Oakridge Flyin. 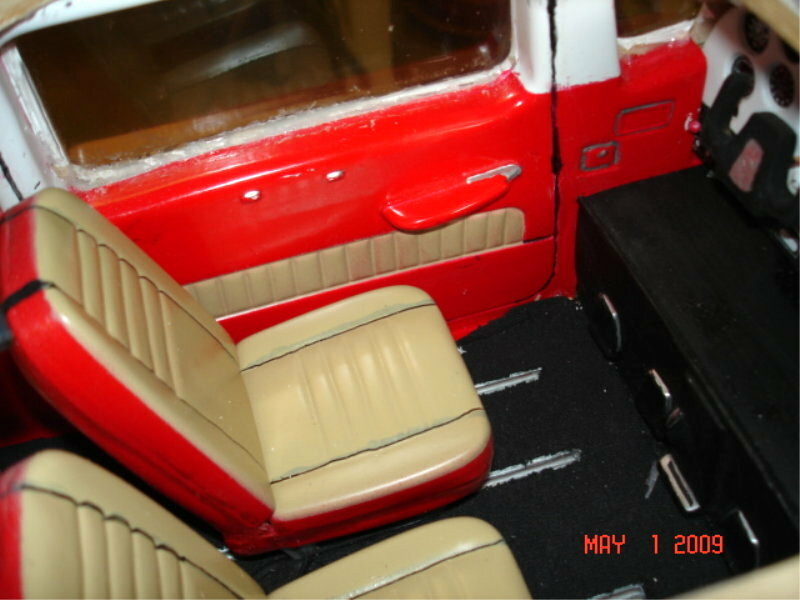 Here are the final pictures of the AgWagon. 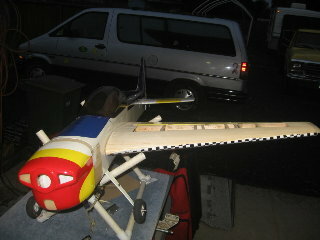 If weather clears it will fly soon !! It is finally done !!!!!! 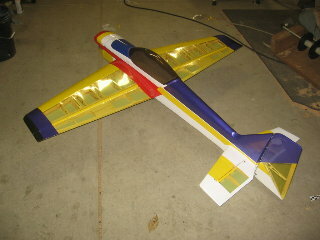 123.5 in wing, Brison 53cc, and 23 lbs !! Yahh Hooooo!!!! 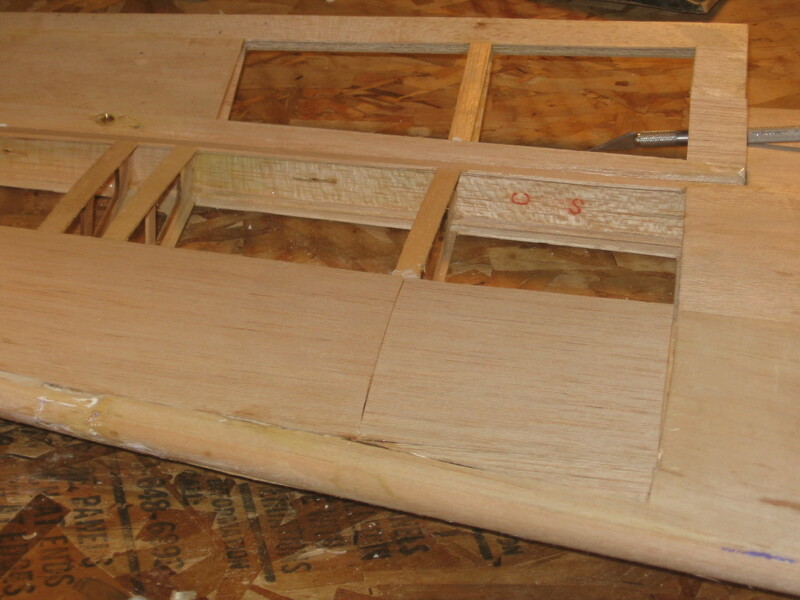 Ag-Wagon is coming along very slow but it coming. Everything is painted and now starts the installation of ailerons, flaps, elevators rudder, servos and radio gear. 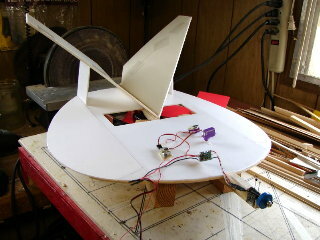 The engine and throttle servo is in and working as is the rudder servo. 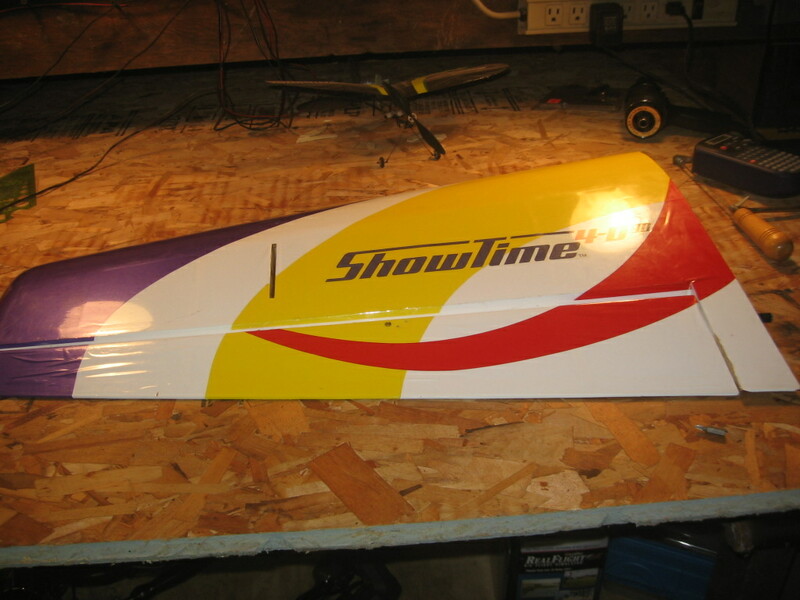 I got all the decals yesterday and I’m excited to put the finishing touches on it... I think Carl would be proud!! 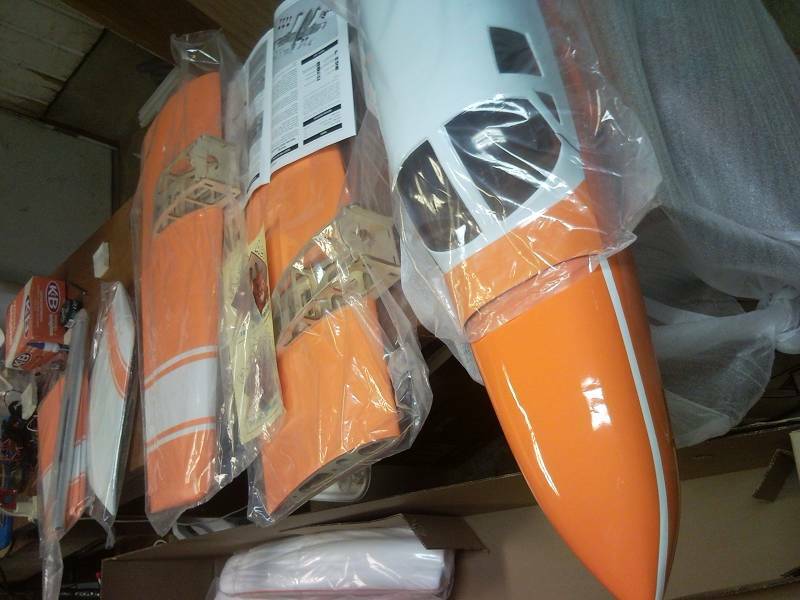 I recently purchased from Nitro Models their Cessna 421C in its bright oranage and white scheme. 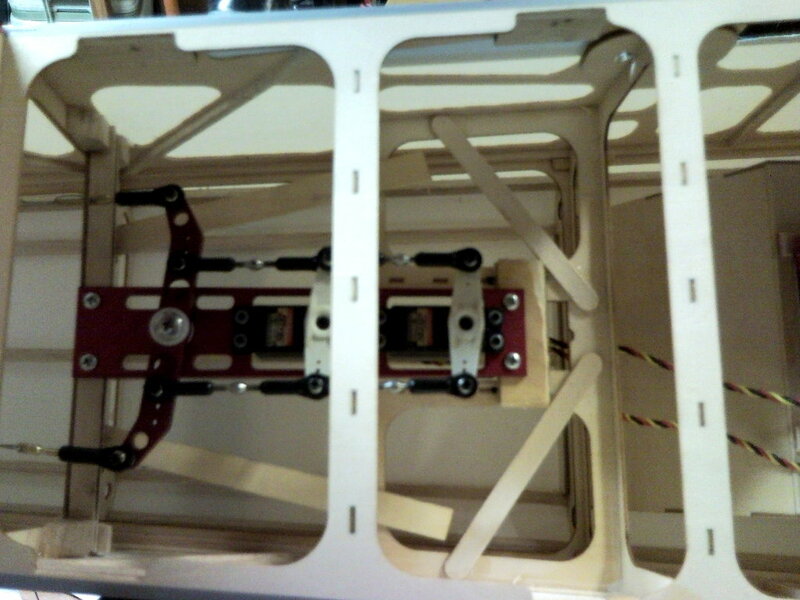 It comes set-up to be easily modded for rail-mount retracts. The fuselage is fiberglass, and is actually pretty well done. 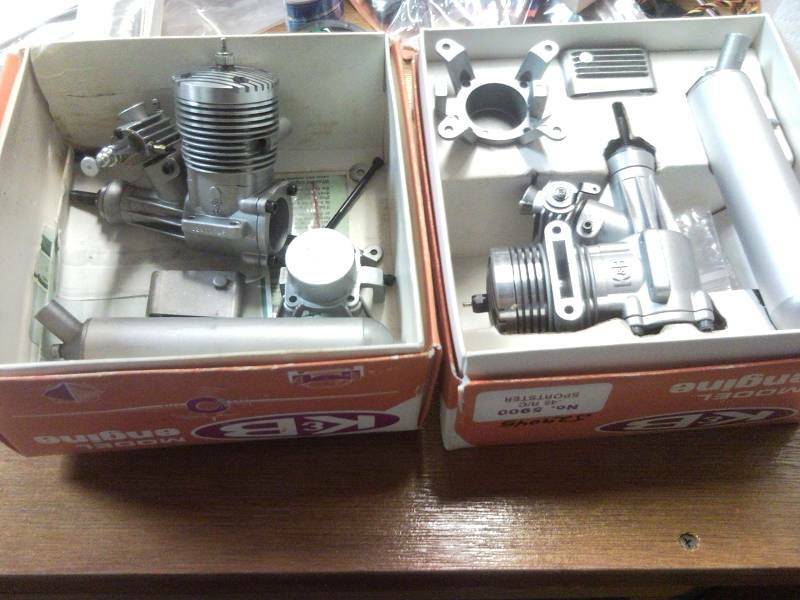 My plan is to use two K&B .45 Sportsters on it and a complete mix of servos that I have lying around. 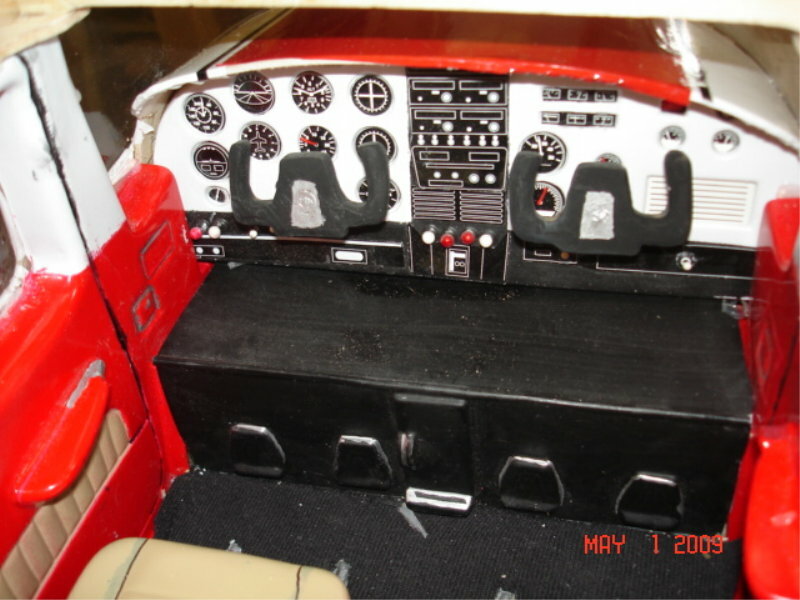 The Cessna 421 is a nostalgic project for me since my dad owned one or two of them over the years and we travelled in them frequently. I was often the co-pilot. I loved that plane and I always wanted to build an R/C version. So, after watching the Nito Models 421 on sale for $199.99 for several weeks, I finally sold some things and bought it. Above are some pictures that I took the day I got it. 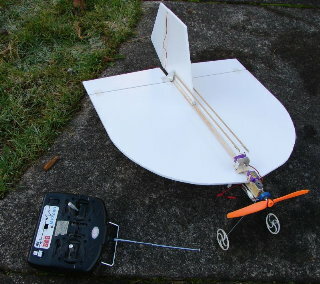 You can see that the canopy arrived with several cracks in it, but using their forum on RCU I got in contact with a gentleman who is sending me a replacement, which should arrive any minute now. It is 99 % done ! CG IS RIGHT ON !! Guna be a fun one !!! 22 1/2 lbs dry !! 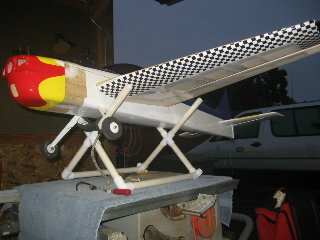 Here is an update on the Cessna 188 (crop duster) It is in final stages of build and will be ready for color this week. It has been a long road with this thing! 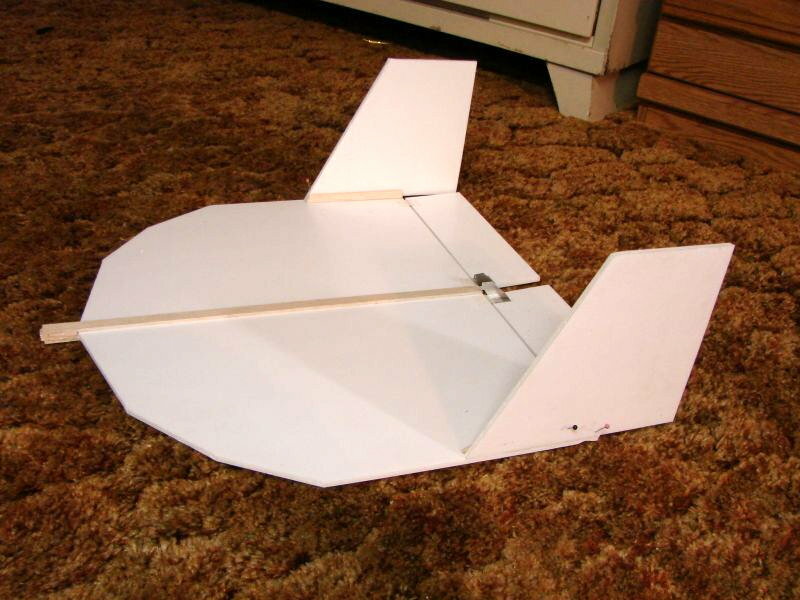 All you have are 4 sheets of plans and a big desire. Building is fun for me anyway. I love it. I used 1.5 oz glass cloth on it and it came out real nice. 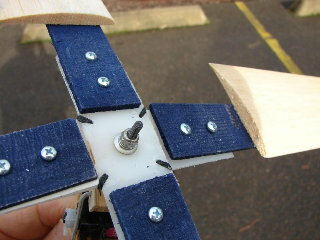 Servos are in the wing along with the flap servos. 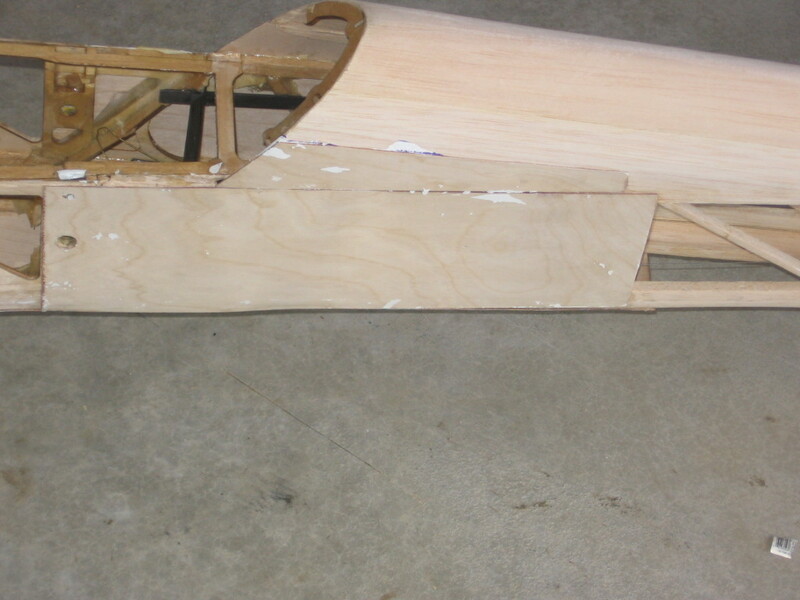 The rudder was a different design then I have ever seen before. For the control horn they use a 1/4 X 5in brass tube bent at the bottom at a 90 degree and the clevis attaches to that. 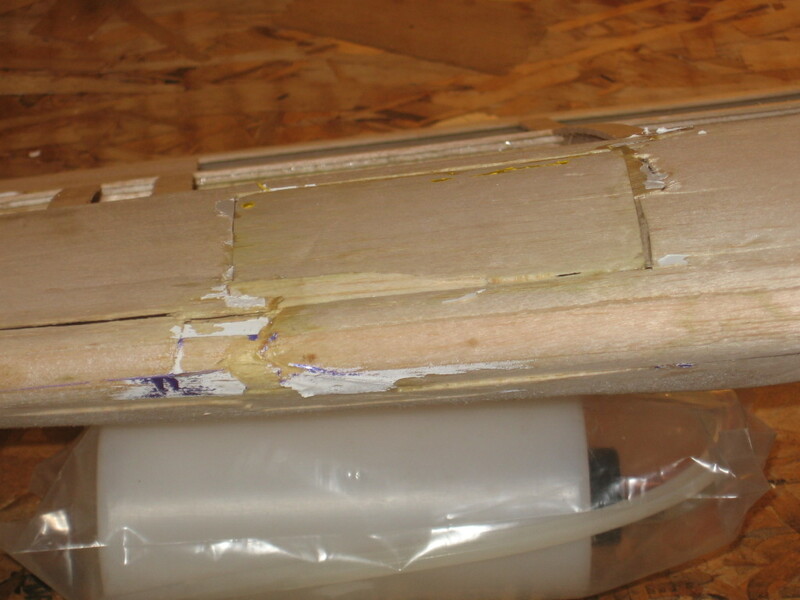 Then you cut a slot 1/4in along the pivot point and epoxy it in place. 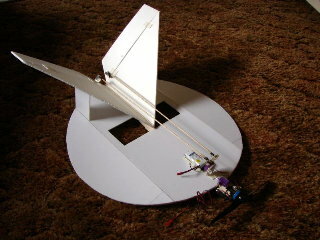 However, Carl must have had a different idea on controlling the rudder. 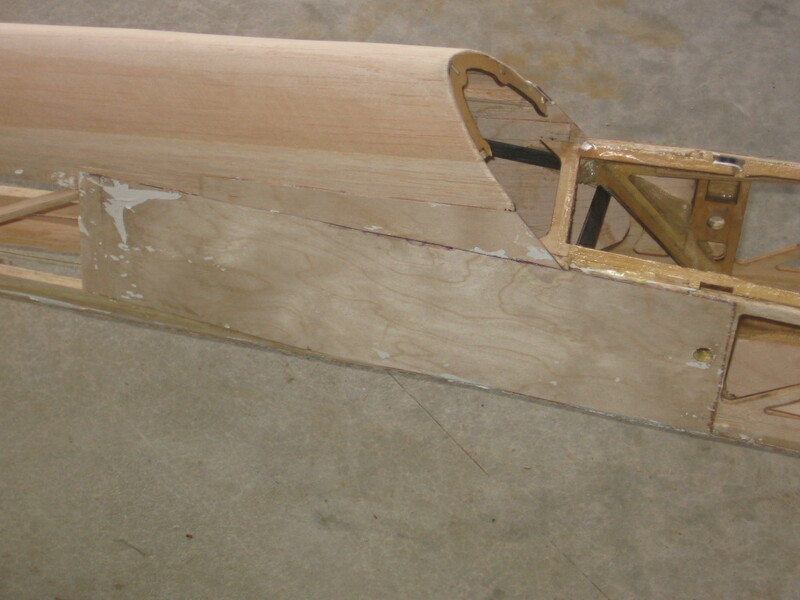 When I tried to install the rudder on the vertical, I found that the rear of the vertical was 3/4 in to far forward. 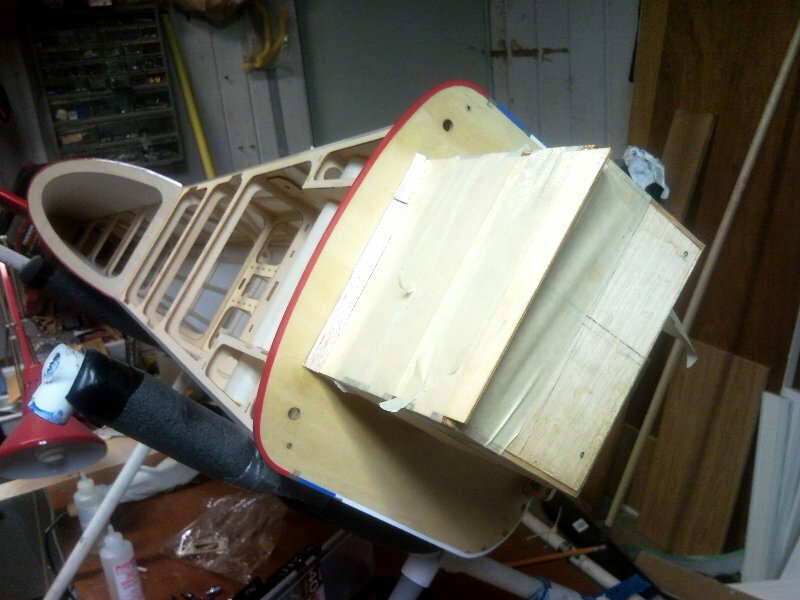 To make this rudder control work I would have to cut through the rear support. Ok now what ??? So I installed a 1/2 balsa to the rear and added small pieces on the sides and thin sanding the h--- out of it .. But it works!! 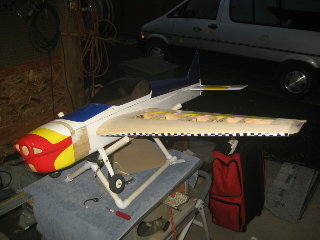 Then I had to modify the tail cone but that was easy! One other modification is the tail wheel. 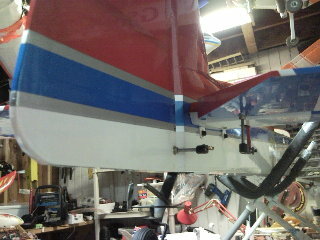 On the plans the tail wheel is free floating (no input) So, I installed pull/pull cables to control the ground steering. The only thing I have left is CG. That will happen tomorrow. The CG will determine where I put the servos for the elevator. I hope I can install them in the back !! Make life easer that way !! 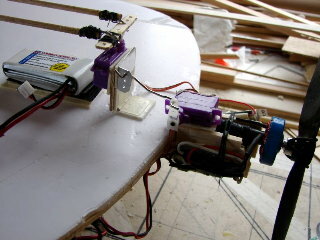 The plans call for one servo for elevator control but I am a believer in two servos for elevator. Doesn’t matter, it’s just one of my things. 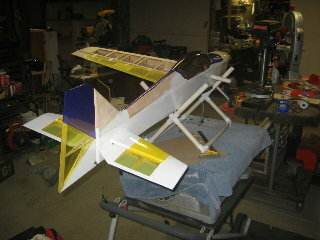 So Boy and girls I will bring it to the March meeting and it should be ready to fly!!!! As some of you know or don’t know Carl Hansen was a builder. He designed and scratched built many airplanes. He started scratch building an Ag-Wagon (some of you may think of this as a crop duster) from “New Zealand Aero Products Planes” (123.5 wing) many years ago witch he never had time to finish. 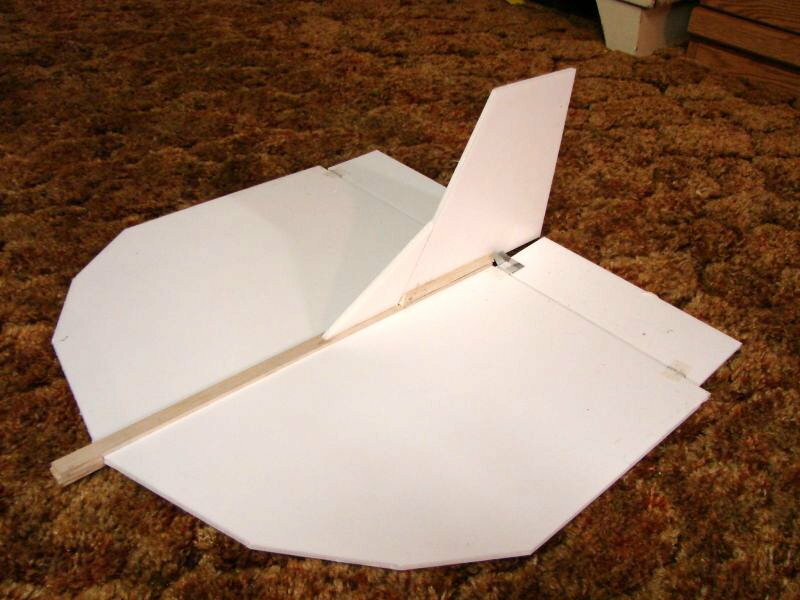 Carl is now flying with the angles. I was fortunate enough to come across this plane and I am now in the process of trying to finish Carl’s work. 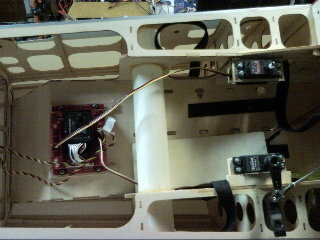 I love building and you fall in love with them and yes when they go in it makes you think of an ARF. 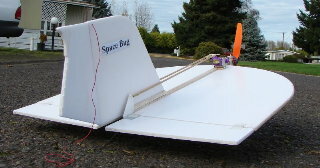 You know 2 days from box to in the air. Anyway, it is designed with the wing (ten feet) all one piece. Well I don’t think so. 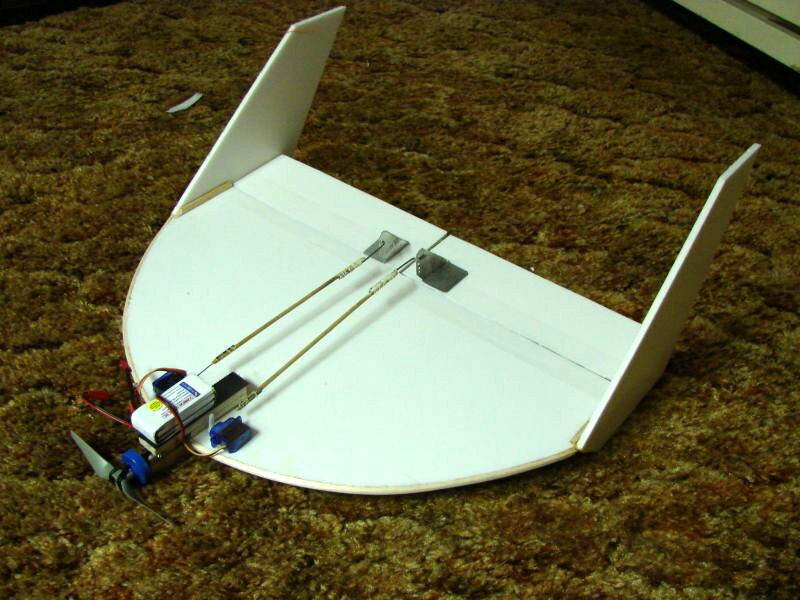 So I designed the wing to be plug in. Took some doing but works. 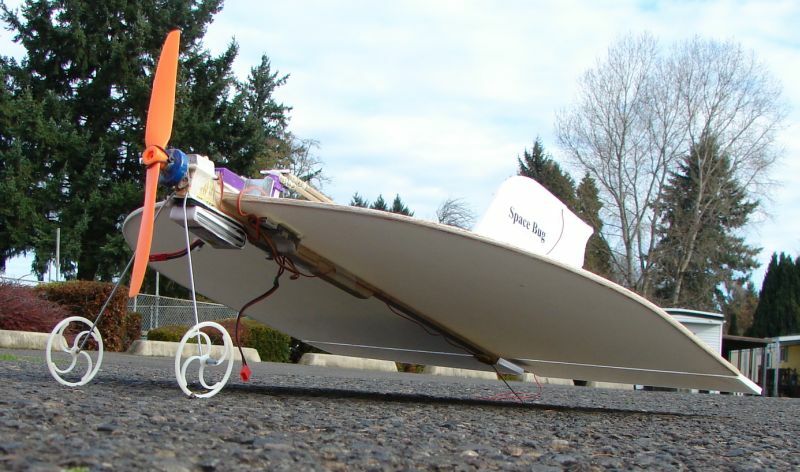 But as things go, when you modify one thing you have to modify something else. 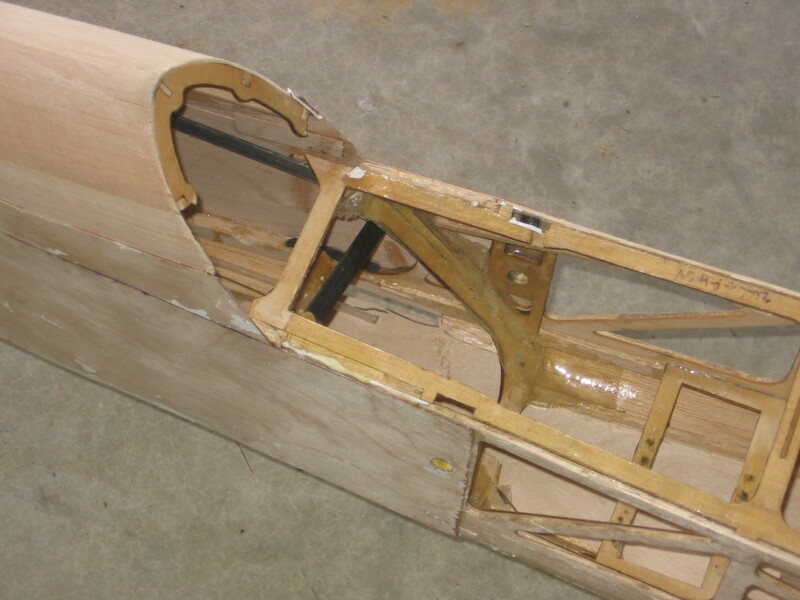 The struts are designed to bolt to the fuselage. I had to redesign them so they are removable both from the wing and fuselage. Let’s talk about the hopper box. 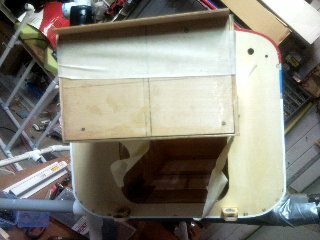 That's the box inside the fus that holds the powder or saw dust or whatever and when you ate ready to drop it. 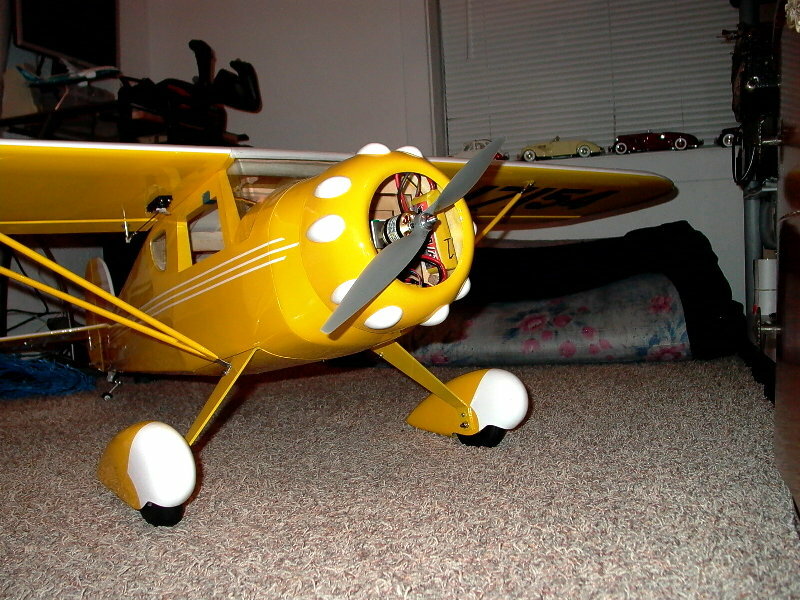 You flip the switch and open the door on the bottom and if your lucky, the stuff flys out and it looks real!! I hope! 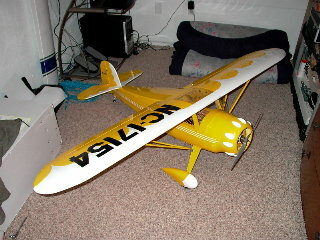 This hopper is 12X11X9 , yes it is a big one. 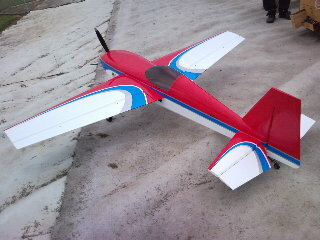 It fits inside the fus . There is a throat that goes through the center of the wing with a door that opens via a servo to let the powder out. Is it getting complicated yet? You should be on my end. Grin. 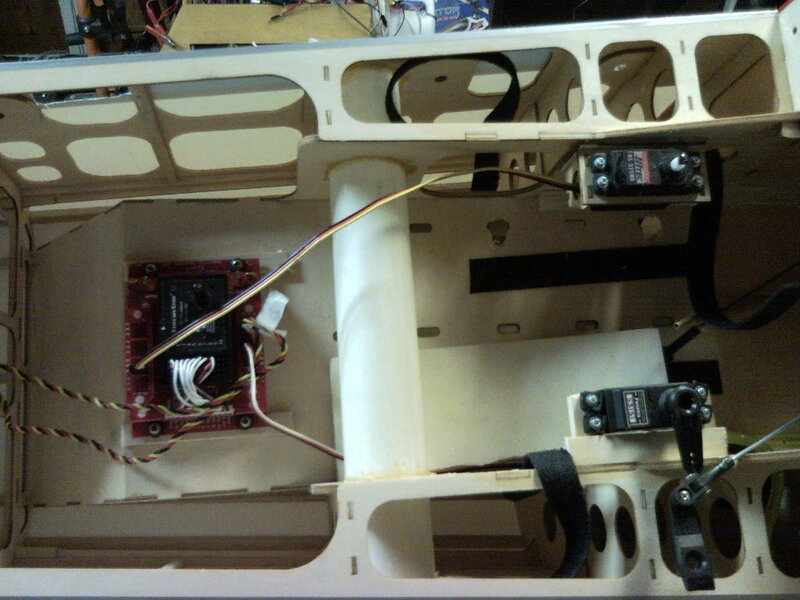 One wing is now sheeted and the servo trays are in. 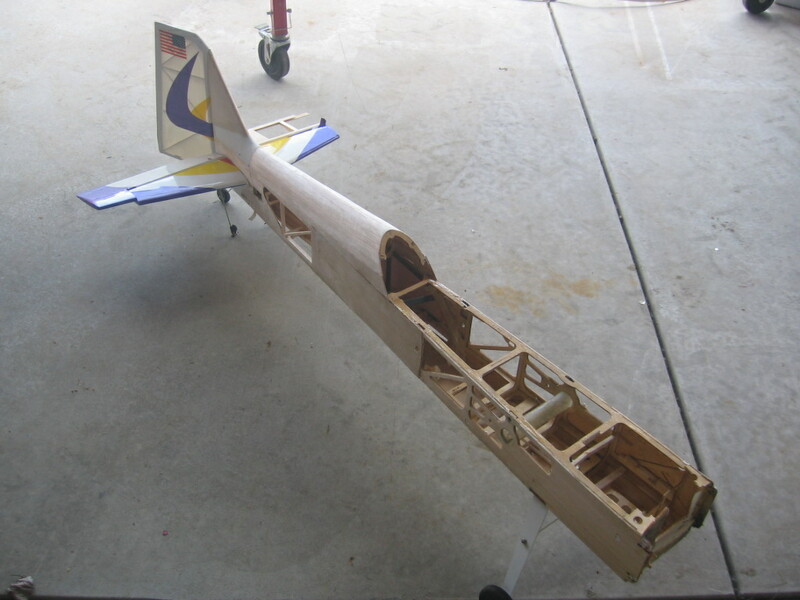 The other wing is still just ribs. I’ll start that today. What engine is he putting in it you asks? Well thanks for asking. I have a Brison 3.2cu (53cc) that I made an engine box and fitted to the firewall. 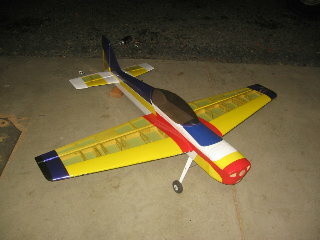 It will spin a 22X8 prop. It should weigh in around 22lbs. - 23 lbs. (I hope). I’m glad the rainy season is here so I can work on it. You see, when I start one of these it becomes unfinished business and I can’t stop until it’s finished. 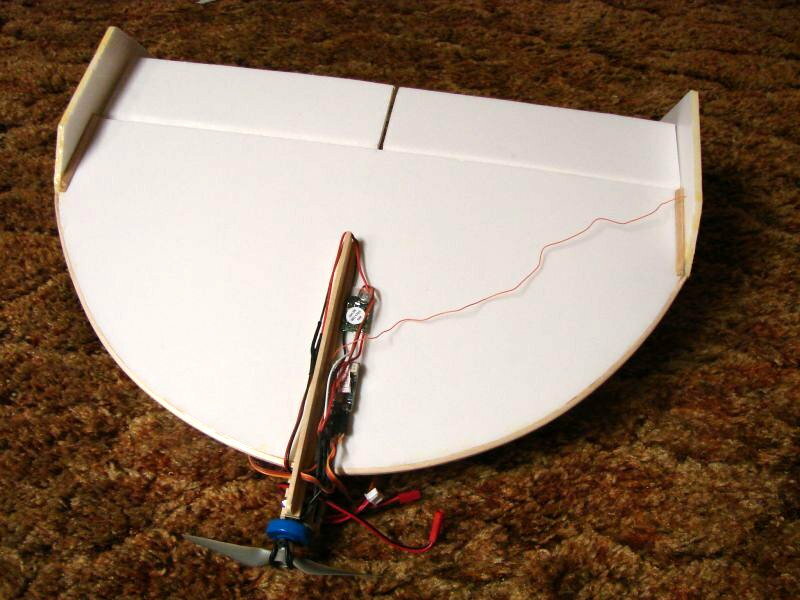 Saucer flying, Even does inverted.